Just a few days before Christmas 2017, Claire’s retail stores made a stunning announcement. It removed certain makeup products from its stores’ shelves and recalled those that had already been sold. The reason for the recall? The products were found to contain asbestos, a deadly substance known to cause mesothelioma, a type of cancer, and other serious lung diseases like asbestosis. Claire’s has issued a statement that their test results showed no asbestos, so a dispute exists. Claire’s is a national retail chain which sells jewelry, accessories and beauty products including makeup. There are hundreds of stores in the U.S. with at least 26 in Illinois. The store was made aware of the asbestos problem after a mother became suspicious and sent some of her 6-year-olds play makeup for testing. She then alerted Claire’s about what she found. Newsweek reports “between 1 million and 400 million pieces of asbestos were found in samples that were sent for testing.” At least nine of Claire’s makeup products have been determined to be tainted with the cancer-causing substance. Most of the contaminated products contain glitter. According to the U.S. Occupational Safety and Health Administration (OSHA), exposure to even a very small amount of asbestos is known to cause cancer. It may take up to 10 to 50 years after exposure for the affected person to experience symptoms. Often, it can be so long after the exposure that the disease develops that people may forget when or where they were exposed. The people exposed to the asbestos from Claire’s makeup, including the children and teenagers who used it, and those who came into contact with those who used it, will live for years with the fear that they may have a mesothelioma diagnosis sometime in their future. Mesothelioma is a type of cancer that affects the membrane that lines certain internal organs, generally targeting the lungs or the intestines. Although rare, it occasionally affects the lining of the heart and can affect the testicles. Even though it may take from 10 to 50 years for symptoms to develop, once mesothelioma presents itself, it is almost always fatal. Early diagnosis and treatment can prolong life, although there is no cure. There is no known safe asbestos level. The substance is inhaled and the small, essentially invisible, fibers get into the lungs. Mesothelioma only occurs in those who have been exposed to asbestos. If someone knows they have been exposed to asbestos, it is recommended they receive periodic imaging tests such as chest x-rays or CT scans to look for changes in the lungs. It is not yet known how valuable these may be in early detection of mesothelioma, but having the tests cannot hurt and may help. It has also been noted that there may be high blood levels of certain substances. It is still not known how valuable periodic blood tests might be to look for these substances, but there is hope that they will help in early detection of the disease. 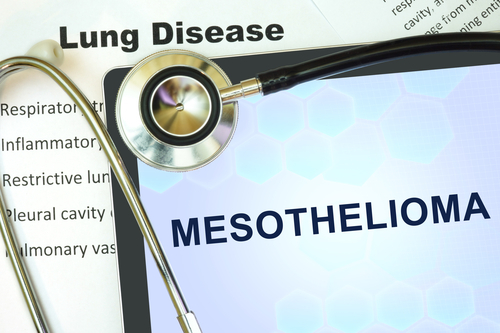 Unfortunately, most mesothelioma is not diagnosed until a person seeks medical treatment for certain symptoms at a time when the cancer has already developed. The symptoms of mesothelioma depend on the organ which is affected. Pleural mesothelioma affecting the lungs. Some of the symptoms are painful coughing, difficulty breathing, excessive sweating and fatigue, fever, shortness of breath and pain in the chest under the rib cage radiating to the back. Peritoneal mesothelioma affecting the abdominal cavity. Abdominal pain and swelling due to fluid retention, nausea, vomiting, weight loss and constipation, among others. Pericardial mesothelioma affecting the lining of the heart. Chest pains and shortness of breath. Your doctor will ask you some questions concerning your symptoms. When did you first notice them? Do you suffer from them constantly, or do they come and go? Is there anything you do that makes your symptoms either better or worse? Be sure to tell your doctor you were exposed to asbestos. If he or she does not seem to be aware of mesothelioma caused by asbestos exposure, you may want to find a doctor who is familiar with the disease. Do not take the risk of a misdiagnosis by someone who is not familiar with the cancer caused only by asbestos exposure. If you are concerned that you or your child, or both of you, were exposed to asbestos in some manner, contact a mesothelioma attorney who has experience pursuing claims against retailers, manufacturers and distributors who put dangerous products on the market. At the Blumenshine Law Group, we have the experience, knowledge and commitment you need to find a remedy for your exposure. Contact us or call (312)766-1000 for a free consultation.